Firefighters are concerned gusty winds and low humidity levels may hamper their efforts to fight a brush fire racing through dry vegetation in the hills north of Glendora. GLENDORA, Calif. -- Despite gusty winds and low humidity levels, firefighters were able to contain about 20 percent of a brush fire racing through dry vegetation in the hills north of Glendora. 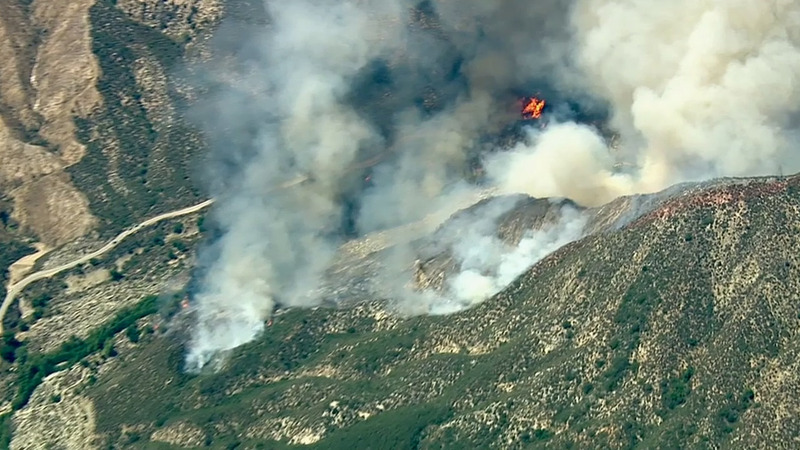 The blaze erupted shortly after 1 p.m. Friday in the Angeles National Forest. The U.S. Forest Service said the wildfire was located three miles north of Rincon Red Box Road off Highway 39. The fire scorched 2,500 acres of tinder-dry brush and torched three structures and an outhouse by Saturday morning, U.S. Forest Service spokesman Andrew Mitchell said. But by Saturday afternoon, the fire had shrunk to 1,448 acres. About 462 firefighters were constructing and enforcing fire containment lines using dozers. "The heat is going to be a factor today and we've got a lot of medium to heavy brush out there," Mitchell said. About 40 people were evacuated from Little Jimmy Trail Camp, West Fork Area, East Fork Area, Coldbrook and Crystal Lake campgrounds. Five firefighters suffered minor injuries. Highway 39 was shut down from the bottom of Old San Gabriel Canyon Road to the intersection of Highway 2. Glendora Ridge and Glendora Mountain roads were also closed from Mt. Baldy Road. Glendora police sent an alert to residents about the fire, but officials said the blaze appeared to be too far from the city to present any immediate danger. A brush fire erupted in the hills north of Glendora Friday afternoon, scorching 10 to 15 acres and destroying a cabin.